Helldunkel ("Bright-dark") displays the emerging synthesis of two stylistic trends within Klee's work: the basic structure of variously shaped rectangles and triangles is derived from Robert Delaunay's Fentre series, over which the artist has superimposed a simple calligraphic architecture composed of x-shaped signs. The zigzag elements override the essential flatness of the structure to create a more bustling and ambiguous space, composed in subtle shades of gray. This approach eventually leads to the constructive drawings of the late 1920s (see lot 565). A photo-certificate from Dr. Josef Helfenstein and Dr. Michael Baumgartner of the Paul Klee Stiftung dated Bern, 20 October 1998 accompanies this watercolor. 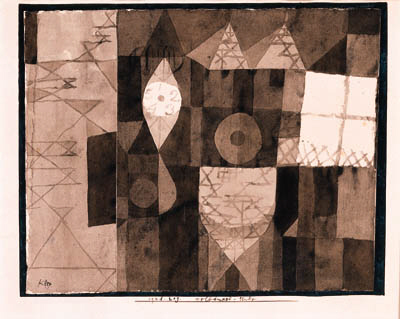 New York, World House Galleries, Paul Klee: Watercolors and Drawings, April-May 1958, no. 6.